There are juxtapositions between Christianity and her Jewish heritage as she speaks about the Christmas tree business her father owned. She speaks to the past, the present and the rest, and how it is internalized to generate new growth if we allow it and do not hinder it with our own doubts and criticisms and dwelling upons. Daphne and Her Discontents by Jane Rosenberg LaForge is a woven history and myth rolled out over several poems. She re-engages readers with old myths to create new ones. Not to be missed. Jane Rosenberg LaForge’s poetry, fiction, critical and personal essays have appeared in numerous publications, including Poetry Quarterly, Wilderness House Literary Review, Ottawa Arts Review, Boston Literary Magazine, THRUSH, Ne’er-Do-Well Literary Magazine, and The Western Journal of Black Studies. Her memoir-fantasy, An Unsuitable Princess, is available from Jaded Ibis Press. Her full-length collection of poetry, With Apologies to Mick Jagger, Other Gods, and All Women was published in fall 2012 by The Aldrich Press. She is also the author of the chapbooks After Voices, published by Burning River of Cleveland in 2009, and Half-Life, from Big Table Publishing of Boston in 2010. She lives in New York City with her husband and daughter. In Remembrance of the Life by Jane Rosenberg LaForge is a chapbook of elegiac poems. While many deal with tough subjects from death to illness and loss, LaForge cautions that these things are inevitable and to deal with them is universal and part of the human condition. However, these moments should not stop us from living; they are a cause for reflection and transformation. In “Ode to the Homeopathic” (pg. 1), the speaker talks about the awe of believing in lost cures for what ails you, but also warns how quickly those hopes can be dashed “as sickness moved from mass/to liquid…” Beauty is held as a virtue because it is created from something pure, unlike jealousy and other emotions that are reactive and cultivated in certain climates by actions of others and ourselves. In “My Mother’s Skin” (pg. 5-6), the speaker wonders aloud at the state of skin and how it comes to get the look it does. Is it from illnesses, abuse, or just the simple process of aging. “I cannot write/about the pattern until I master it/” the speaker says. Discovering the pattern of a life can be difficult from the outside, and even as doctors argue “about what to put on the death certificate/”, readers are left wondering why must we pin down that pattern. Many of LaForge’s poems require careful attention and could require readers to take second and even third looks, but this does not mean the poems are hard to understand. They are in fact packed fully with imagery and meaning that are interconnected to provide readers an overall sense of the inevitability of death. We should not focus on the end result, however, but on how we have lived and how others have lived — savoring each moment and memory. It also asks the question about medical intervention and whether it is for the patient or ourselves that we prolong lives with tubes and wires? “My father said a lot of things,/like how death took much longer when he/ was a child, not so many tubes in the patient/as the hospital floor covered in trunk lines,/more for show than purpose.” (from “How It Works For Others” pg. 21-22) In Remembrance of the Life by Jane Rosenberg LaForge is a slim and powerful collection remembering life in all its beautiful confusion and ugliness. Jane Rosenberg LaForge’s poetry, fiction, critical, and personal essays have appeared in numerous publications, including Poetry Quarterly, Wilderness House Literary Review, Ottawa Arts Review, Boston Literary Magazine, THRUSH, Ne’er-Do-Well Literary Magazine, and The Western Journal of Black Studies. Her memoir-fantasy, An Unsuitable Princess, is available from Jaded Ibis Press. Her full-length collection of poetry, With Apologies to Mick Jagger, Other Gods, and All Women was published in fall 2012 by The Aldrich Press. She is also the author of the chapbooks After Voices, published by Burning River of Cleveland in 2009, and Half-Life, from Big Table Publishing of Boston in 2010. She is a poet and writer living in New York. Follow her on Twitter: @JaneRLaForge. And see her author page on Facebook. 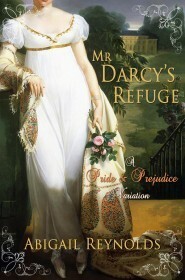 Mr. Darcy’s Refuge: A Pride & Prejudice Variation by Abigail Reynolds purchased from Audible. The river isn’t the only thing overflowing in Hunsford when a natural disaster forces Elizabeth Bennet and Mr. Darcy to work together. The residents of flood-stricken Hunsford, seeking refuge in the parsonage atop the hill, are unaware they are interrupting Darcy’s disastrous proposal. Even worse, the flood has washed out the only bridge to Rosings Park, stranding Darcy with the woman who has just refused his offer of marriage. But it may already be too late to redeem Elizabeth’s reputation…. Disinheritance: Poems by John Sibley Williams for review in September. A lyrical, philosophical, and tender exploration of the various voices of grief, including those of the broken, the healing, the son-become-father, and the dead, Disinheritance acknowledges loss while celebrating the uncertainty of a world in constant revision. From the concrete consequences of each human gesture to soulful interrogations into “this amalgam of real / and fabled light,” these poems inhabit an unsteady betweenness, where ghosts can be more real than the flesh and blood of one’s own hands. In Remembrance of the Life by Jane Rosenberg LaForge for review from the poet. With Apologies to Mick Jagger, Other Gods, and All Women by Jane Rosenberg LaForge takes a look at not only what it means to be young and full of dreams, aspirations, and confidence, but also the flip side of that — what it means to be older and confined by societal, professional, and personal constraints. Her verse is topsy turvey with its own underground beat that shimmies out the fine-tuned truth that whether or not we are rock gods or ordinary people we are the same in how we are shaped and how we shape the world around us. From hiding our wrinkles and our broken dreams to wearing them proudly, LaForge has crafted an unapologetic anthem about living, not merely surviving the world around us. irreparably, as if it weren't worth mentioning. The collection is divided into two parts, and the first section, despite the title of the Mick Jagger poem, are hardly apologetic. From the crass way that age takes over the face to the abandonment of religion and faith in favor of the present and those rock stars before us on the television, LaForge chooses terse language clipped in the right places to give readers enough pause to encourage serious contemplation about aging and worship of the present. In “Runyon Canyon,” her narrator says, “It is not the soul that grows/in your bone, but a whistle;/as if a palpable friction between/lip and reed; a green-sweet taste/like hesitation and sympathy;” These images blend together to create a sound that hums. In the second half of the collection, the poems are more personal, delving into the sorrowful images of disease and how the body can be ravaged even when the patient is in denial or at least trying to pretend they are not ill. LaForge takes a frank look at the grotesque found in the most beautiful relationships, including being sisters. With Apologies to Mick Jagger, Other Gods, and All Women by Jane Rosenberg LaForge strikes a pose and has an opinion without apology, and don’t expect one. The statements are bold and without explanation. They just are. Jane Rosenberg LaForge’s poetry, fiction, critical and personal essays have appeared in numerous publications, including Poetry Quarterly, Wilderness House Literary Review, Ottawa Arts Review, Boston Literary Magazine, THRUSH, Ne’er-Do-Well Literary Magazine, and The Western Journal of Black Studies. This is the 23rd book for my 2012 Fearless Poetry Exploration Reading Challenge. 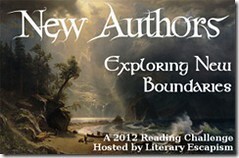 This is my 82nd book for the New Authors Reading Challenge in 2012. 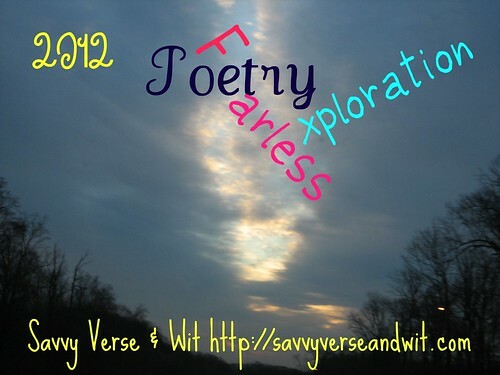 Welcome to the 171st Virtual Poetry Circle! Also, sign up for the 2012 Fearless Poetry Reading Challenge because its simple; you only need to read 1 book of poetry. 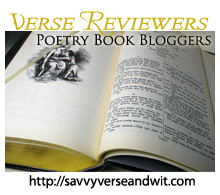 Please visit the stops on the 2012 National Poetry Month Blog Tour. out their height and freedom. have always been a spectator. Mailbox Mondays (click the icon to check out the new blog) has gone on tour since Marcia at A Girl and Her Books, formerly The Printed Page passed the torch. This month’s host is BookNAround. 2. Haunted by P.C. Cast and Kristin Cast, which I already had and didn’t realize, so I’ll be re-donating it to the library for them to sell again! 5. Tempted by P.C. Cast and Kristin Cast; I still need the second book, Betrayed. 6. Undercover by Beth Kephart, which is my favorite of her books and one I had borrowed from the library but did not own; Thanks, Anna for finding it. 10. Between Two Fires by Christopher Buehlman, which came unsolicited from Penguin. 11. Things Your Dog Doesn’t Want You to Know by Hy Conrad and Jeff Johnson for a TLC Book Tour in October. 12. The Boys of ’67 by Dr. Andrew Wiest for review. 13. One Last Strike by Tony La Russa, which came unexpectedly and will likely be passed onto someone who would love to read it. 14. The Demoness of Waking Dreams by Stephanie Chong, which came unexpectedly from WunderkindPR and will likely also find a new home. 15. 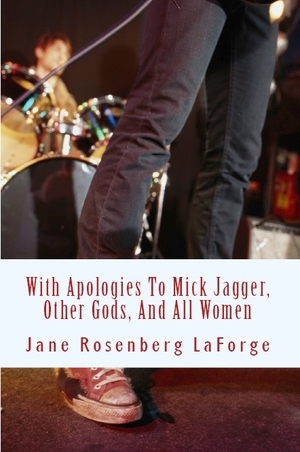 With Apologies to Mick Jagger, Other Gods, and All Women by Jane Rosenberg LaForge for review.